One of my favorite styles to wear in the summer is matching sets. I absolutely love how versatile they are. They look perfect together or you can mix and match each piece with other clothes in your closet to get completely different looks. I got this adorable floral matching set from Bishop + Young and I'm loving it. The fabric is super soft and silky which is perfect to wear in the current Temecula heat. I love the warm neutral color palette which makes it easy to mix and match with other items I already own. With Fall right around the corner I decided to pair each piece with something to easily transition into the new season. 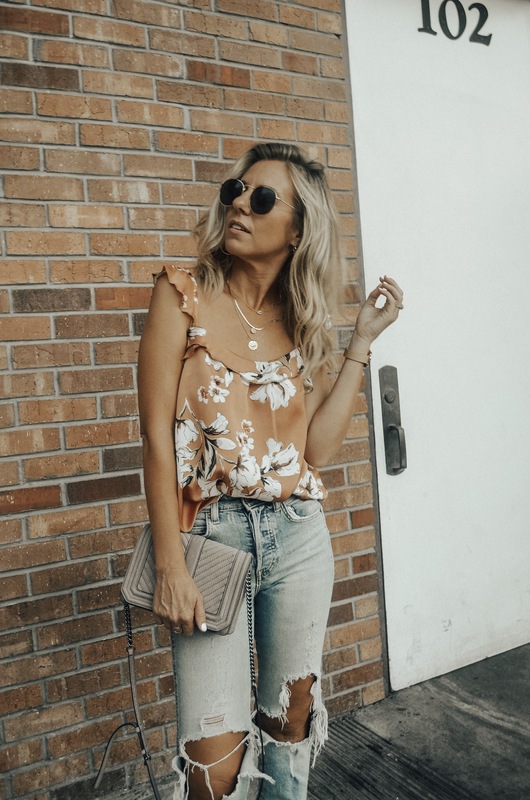 Starting off with the floral ruffle top I added my favorite pair of distressed denim and the new snakeskin studded mules I got from the Nordstrom sale. Denim is my go to during the Fall season and when the temperature starts to drop I can just add a cozy sweater or or blazer to the look. I decided to pair the floral ruffle shorts with a classic black and white striped tee. There's something about putting stripes and floral together that I absolutely love. And there's nothing better to transition into the Fall season then with a good pair of block heel booties. So what do you think of the different ways I styled this matching set? Bishop + Young have tons of great matching sets and other California lifestyle inspired pieces. You can check out their website HERE or shop several pieces from Nordstrom, Zappos and Anthropologie. Check out a few favorite styles below. Thank you to Bishop + Young for collaborating on this post.